It's been a while since our last report. As always we have some very good excuses, although probably not good enough to post here. The weather is the worst it's been in fourteen years, but we've still managed to take a few drives in the Locost between rainstorms, and occasionally during rainstorms when we didn't have enough sense to stay home. Recent repairs to the Locost are holding up well. Our spare tire remains firmly attached to the new channel mount, and the boot cover has been snapping and unsnapping flawlessly on demand. The car feels like new again, solid and rattle-free, a joy to drive. Twenty more horsepower hasn't hurt, either. As it happens, we haven't had much to report. An annoying squeak we heard for months turned out to be a loose headlight retainer, fixed in a few seconds with a flat blade screwdriver. One Monday morning the starter failed to rotate, but that turned out to be a dead battery, the result of driving in the rain with the headlights on, which isn't normally a problem so long as you remember to switch the lights off when you get home. We had to tighten a few nuts on the exhaust manifold when the pipe started banging loose, and we also had a minor issue with the distributor cap. For several weeks we noticed the car was getting increasingly difficult to start. It was also running poorly with occasional misfires, and stumbling at idle. We weren't sure why. Could've been fuel, could've been timing. Then one afternoon the car died at a stoplight and wouldn't restart. We had to get a tow. 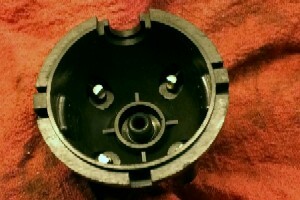 It wasn't until we got the car home and pulled the distributor cap that we noticed the center carbon brush was MIA. We're not sure how it came loose, or where it disappeared to, but somehow the car managed to run without it, albeit not all that well. But that was it. Outside of tightening the exhaust and replacing the distributor cap, we haven't worked on the car at all. We still have a list of things we want to do, like getting the windshield wipers to work and installing a quieter exhaust system, but we've found it's easy enough to see around the windshield in the rain, with practice, and a new exhaust seems like a lot of work. 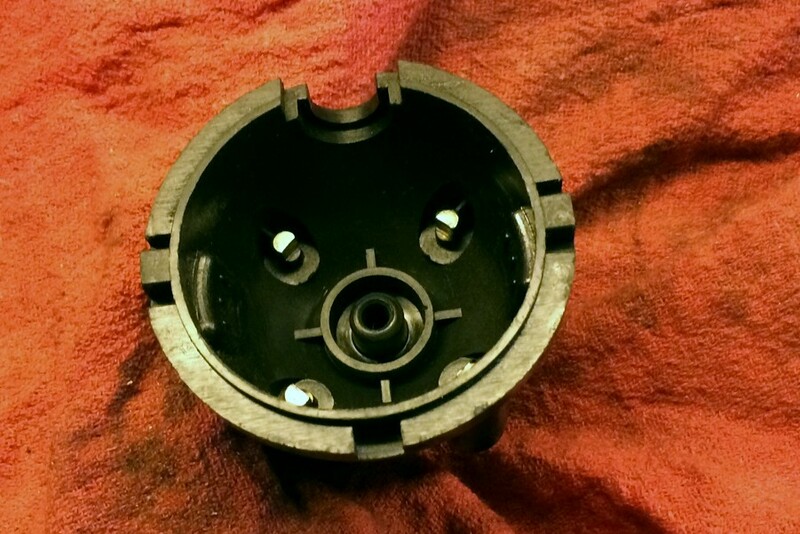 So we thought we were okay for now, but then last week another item on the list popped up when we spotted a post on the MG Experience website about a new offering from a Mustang parts supplier. The first Mustangs, back in the early sixties, had four-bolt wheels with the same bolt circle as the MGB. 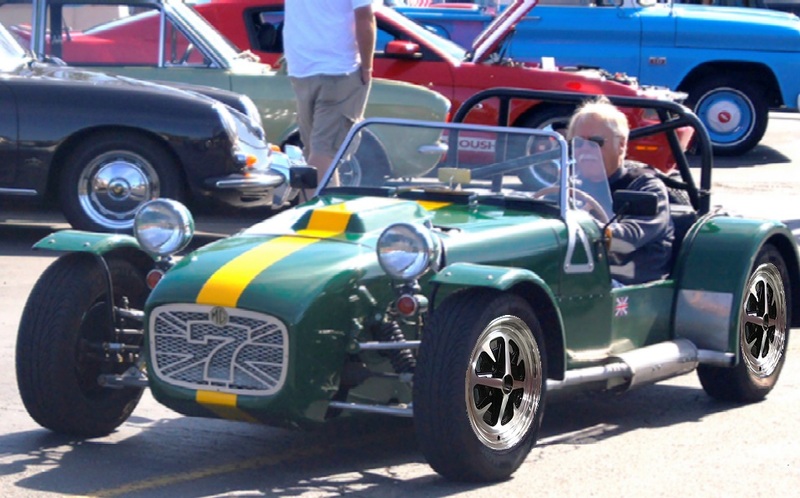 The Mustang wheel had a narrower offset than the MGB wheel, which pretty much precluded their use on standard MGBs, but it wouldn't be a problem today for our wide-track Locost. The stock Rostyles barely fit as it is. Unfortunately, aftermarket wheels for early Mustangs were generally limited to five-spoke and slot mags, not really our cup of tea. The Datsun 240Z had the same bolt pattern and offset as the Mustang, but also pretty much the same aftermarket for wheels. So we were quite surprised to find a company selling shiny alloy wheels for early Mustangs that look exactly like British Rostyles. Not similar-looking, not almost the same, but identical. 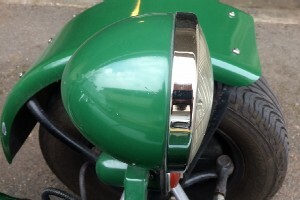 The only difference, Rostyles were stamped from steel and were more or less round. 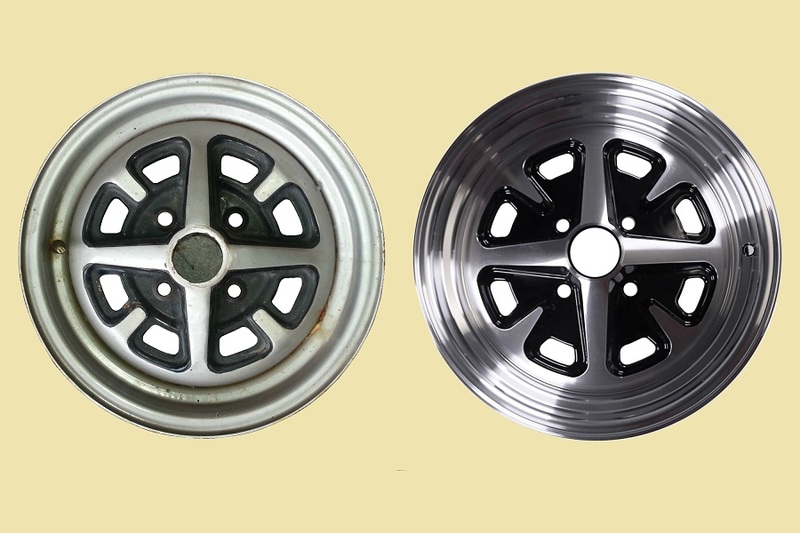 The Mustang wheels are cast and machined alloys, and are totally round. They're also 6" wide, which may not sound like a lot in modern automotive terms but it's a big step up from the 5" steel Rostyles on our Locost, which in their day was a big step up from the 4-1/2" wire wheels delivered with most MGBs. 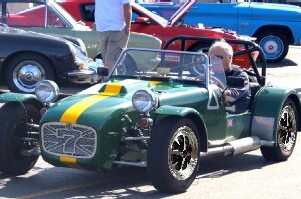 For a couple of years now we've been eyeing the Minilite-style MGB wheels offered by Moss Motors. We even posted a picture here with the Minilites photoshopped onto our Locost. The Minilite is a fine-looking wheel, and we've long known that round wheels would be a huge improvement in ride and handling over our semi-round Rostyles, so we've always wanted them. But wanting something and paying for them are two different things. Moss wants $157 apiece for the wheels, plus sales tax, plus shipping. So $190 and change. The Mustang wheels are $148, no tax and free shipping. 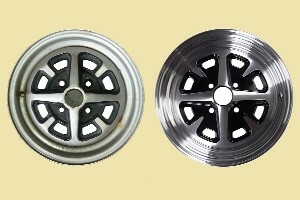 Even better, the Mustang wheels are half an inch wider and two pounds lighter than the Moss wheels. So it's a no-brainer. Still, $148 is a sizeable investment, especially when you multiply it by four, and we couldn't be 100% sure the Mustang wheels would fit, so we only bought one. We'll get a tire for it somehow�nothing in our current stock of used 14" tires will work�and mount it on the left rear. If it doesn't fit, we'll make it our new spare. If it does fit, we'll still make it our new spare, because you can't have two different size tires on either side of the car. But if by some chance we are able to fit the new wheel on the car, and the tire doesn't totally rub up against the suspension, our next big purchase will be a second wheel just like it, so we can run both wheels at the rear. Then one day, as the budget allows, we'll buy a third wheel for the spare, and then someday if we're really lucky a fourth to complete the package. Four shiny alloys would look totally cool, and just to be sure, we photoshopped them over our photoshopped Minilites, and they do look totally cool. Of course buying one wheel at a time might seem a little ghetto, but if you think about it, that's how we managed to afford a whole Locost.